Originally published under the title "Democrat Running for Virginia Governor Has Ties to Islamists." Lt. Governor Ralph Northam speaks on June 2 at the ADAMS Center, a "regular stopping point" for Virginia politicians. Virginia's Lieutenant Governor, Ralph Northam, is now the Democratic nominee in the race for governor. Working to rally support in a state that was once Republican-dominated but has leaned Democratic in recent presidential and gubernatorial elections, Northam has been reaching out to many different constituencies—including Virginia's growing Muslim community. 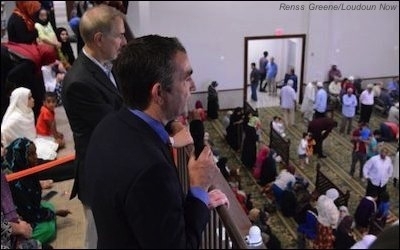 Shortly before winning his primary in June, Northam spoke at the All Dulles Area Muslim Society (ADAMS) Center, emphasizing his opposition to President Donald Trump's "Muslim ban" and his commitment to an "inclusive" Virginia. Lt. Governor Northam has been to ADAMS before, notably in February in the immediate aftermath of Trump's travel ban. He was part of a group of politicians including Virginia's governor, Terry McAuliffe, who were eager to show their opposition to Trump and their support for the Muslim community. While such tolerant sentiments are laudable, the choice of venue was striking—and worrisome. The ADAMS Center is tightly connected to the so-called SAAR network, an organization of Islamist terror financiers that has inexplicably escaped punishment. Though Federal agents uncovered staggering amounts of evidence against members of the SAAR network, political interference led to the case being dropped. As a consequence, entities within the SAAR network are free to curry favor with politicians like Northam. Not coincidentally, Northam has received donations from at least two companies, Mar-Jac Investments ($3,000) and Reston Investments ($3,250), that are actually part of the SAAR network. For Northam to hold high-profile events at ADAMS gives unwarranted credibility to extremists, to the detriment of the mainstream Muslim community. The ADAMS Center is tightly connected to the Islamist SAAR network. Organized around the now-defunct SAAR Foundation, the SAAR network is a web of over 100 purported charities, nonprofits, and financial firms that were accused of laundering money for terrorism. According to a federal affidavit filed by customs investigator David Kane, the SAAR network was set up with millions of dollars in Saudi cash, then used to funnel money to the likes of convicted terror financier Sami al-Arian, the North American representative of Palestinian Islamic Jihad. Additionally, at least $26 million was routed to suspicious accounts in the Bahamas and the Isle of Man that may have been used to fund Hamas. The SAAR entities share many of the same personnel as officers or directors, with single individuals controlling dozens of companies. The network includes financial firms such as Reston Investments, supposed charities such as the York Foundation, and the Sterling Charitable Gift Fund, and an eclectic mix of nonprofits, management-training firms, and religious publishers. Many SAAR network entities were housed in the same building (555 Grove St. in Herndon) and apparently run out of the same office. 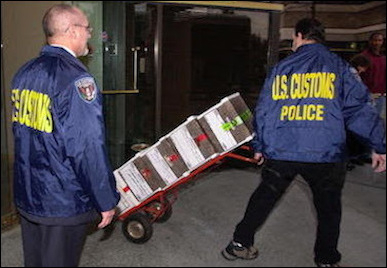 U.S. Customs police carry out boxes of evidence during a raid on SAAR network businesses in Herndon, VA, on March 20, 2002. That address is notable, because it was also the Herndon office of the ADAMS Center. Indeed, a founder of ADAMS, Ahmad Totonji, was also a founder of the SAAR Foundation and several other SAAR network entities. Furthermore, ADAMS Executive Director Mohamed Magid was an advisor to the Sterling Charitable Gift Fund. Other SAAR network personnel also had key positions in ADAMS, including M. Omar Ashraf (a member of the ADAMS Center Project Committee) and Muhammad Ashraf (ADAMS's legal advisor). ADAMS's relationship with the SAAR network goes well beyond merely sharing staff and office space. Large amounts of money have been documented flowing from the network through ADAMS, and back into other network entities. Whatever its legitimate communal activities, ADAMS was fully a part of the money-laundering activities of the SAAR network. And for Northam to hold his event there, at the same time as he accepts campaign contributions from the SAAR network, is unsettling. Unlike ADAMS, the vast majority of Virginia mosques have had nothing to do with terrorism in any form. Virginia has dozens of mosques serving the Muslim community—the vast majority of which have had nothing to do with terrorism in any form. For Northam and other prominent politicians to hold major political events at the ADAMS Center, with its documented links to terror financing, is to forsake the many everyday Muslims in Virginia who oppose terrorism just as much as other Americans do. Northam and other Democrats would be well advised to reach beyond the usual politically-connected Islamist influence peddlers, and to interact more with the Muslim mainstream in Virginia. They will better serve their constituents, and the country, if they do.